No wasted space when packing a cup. This unique design from Olicamp is designed to fit over the end of a round 1Qt. Nalgene, as well as most other round 1Qt. bottles and the Klean Kanteen 40 oz, eliminating the wasted space of packing a traditional cup. Made from high quality 18/8 stainless steel, the wire handles fold flat to save space and extend enough to use the cup to cook without burning your fingers. 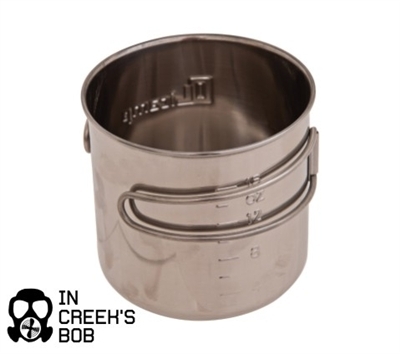 Also great as a measuring cup with easy to read graduations on the side of the cup. Capacity: 16 oz.